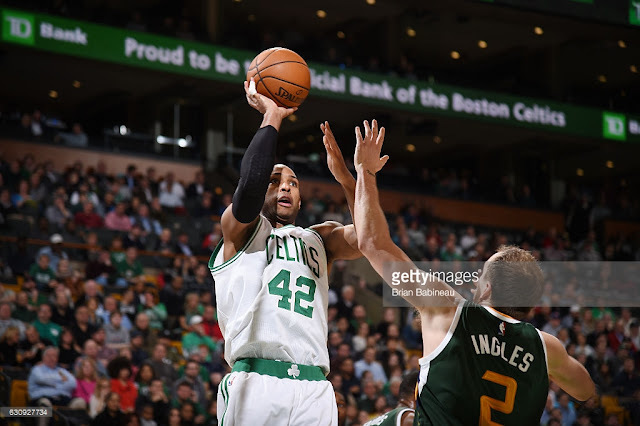 The Boston Celtics lost to the Utah Jazz, 107-95 behind Ricky Rubio's 22 points on 10-15 shooting. The Celtics started the game strong, but after falling off in the second quarter, never made a dent in Utah's lead. Gordon Hayward said that, with the Jazz in town for Friday’s game vs. the Celtics, he’s hoping to meet up with some of his former teammates. And while he said it will be "weird" to watch his former team play his current one, Hayward playfully added, "I hope we beat them by 40." Gordon Hayward really wishes he was playing against the Utah Jazz tonight. "It makes it harder to sit back & watch. This is a game I had circled as well. I know they did. In front of my home crowd, it would've been a lot of fun. Just gonna watch & I'll see those guys afterwards." The game began bearing bad tidings. Less than two minutes into the first quarter, Utah's Rudy Gobert went down with a knee injury, and it didn't look good. The head of a falling Derrick Favors hit the side of Gobert's knee, it buckled, and he went down in pain. The 25 year old has been effective on both ends of the floor this year, and is averaging 12 points, 10 rebounds, and 2.5 blocks per game. Last season, Gobert lead the league in blocks with 214, and was a member the the NBA's All-Defense First Team. Then later in the quarter, Daniel Theis exited the game after suffering a facial injury while fighting for a rebound under the basket. He walked off of the court with blood dripping from his mouth/nose. Let's hope that this injury doesn't cause Theis to miss any games. We may be seeing another masked Celtic hit the floor soon. Later on, in the second quarter, another big-man went down and was never seen again. Derrick Favors was poked in the eye and escorted to the locker room. The gash on his upper-mug would require some medical work. The game began with a Celtics' alum showing his stuff. Jonas Jerebko returned to the Garden for the first time since signing with the Jazz last offseason. Early in the game, he stole the ball on his side of the court, and took it all the way to the basket for the contested bucket. Just a few plays later, he drained a three for the Jazz. He ended the game with 17 points on 6-of-8 shooting and 7 rebounds. Al Horford came back from his day-off on Wednesday and started with an effective first quarter. He began the game by hitting his first four shots, and finished it with ten points and four assists. He led both team in those categories after one, and the Cs left the first quarter up 5, 26-21. Horford would continue this production throughout the game, and finished with another near triple-double of 21 points, 6 rebounds, and 7 assists. End of Q1: Celtics 26, Jazz 21. Al Horford leads the game in both points (10) and assists (4). Irving: 6 points, 2 assists. Ojeleye: 5 points off the bench. The second-quarter-terrors returned tonight. The Cs began the quarter by missing their first 14 shots, and didn't hit from the field until Jaylen Brown scored an and-one layup, more than seven minutes into the game. The Jazz outscored the Celtics by 12 points in the second, finishing with a 25-13 advantage. Only 13 points! The Cs turned the ball over seven times and shot below 16% in the quarter. They'd never recover. In second quarter, Ricky Rubio was 4-4 for Utah and Celtics were 4-21. Don't bet on that kind of shooting to continue in second half for Rubio or the Celtics. The third quarter was a battle of point guards. Ricky Rubio, the first year Utahn, kept his first half flow intact, and consistently took the Celts to the rack, hitting a few nifty baskets in the process. He scored 10 of his 22 points in the third. The other dominant guard in the third quarter was Kyrie Irving. He finished the tilt with a game-high 33 points, 16 of which came in the third. Nonetheless, the Celtics left the third quarter down twelve. End of Q3: Jazz 79, Celtics 67. Irving scored 16 of his game-high 29 points in the 3rd. Horford pitching in with 16 points, 6 assists. The fourth came and went and nothing significant happened. Both teams scored 28 in the quarter, and the Celtics took an L, the third in their last five games. In the fourth, however, Brad Stevens was in a maniacal mood, and played a five-guard lineup a few different times. It was a nice thought in an attempt to make a comeback, especially with two of the Jazz's big-men out of the game, but it failed. Jaylen Brown playing center right now. He's out there with Smart, Irving, Rozier and Larkin. Five guards. Unreal. Final: Jazz 107, Celtics 95. Something that everyone in the arena agreed on was the piss-poor refereeing. Early in the game after a few missed calls, Tommy Heinsohn made known that they were, "two young officials that [he's] never seen before"; later in the game, Kyrie would miss an entire defensive play because he was complaining to an official; in the 4th, Marcus Smart made a clean block that was called a foul, which made the Garden erupt; and at the end of the game, Ricky Rubio fouled out, and wasn't happy with the call. The Celtics struggled this week, the beginning of their busy month. They haven't shown the heart or hustle that was prevalent during the team's first 20 wins, and have now lost multiple games by double-digits in the past week. Brad Stevens points out that, "We haven’t been in [tonight's] situation very often from an effort standpoint, but I think twice this week we have, and that’s concerning." Guerschon Yabusele: 3 points, 100% from the field!!!!! The Celtics will face the Memphis Grizzlies tomorrow night on the second game of a back-to-back.